The 60 year old passenger terminal at Heathrow airport has been demolished, and is in the process of being replaced with a brand new building, which when complete, will encompass the latest in airport technologies and state-of-the-art facilities. The £2.5bn terminal will see 20 million passengers pass through it doors every year, and when the second phase of the construction is complete this will increase to 30 million passengers a year! However not only will the new terminal improve passenger ratings, but it will also see shorter security queues and more reliable baggage systems, which will really pull Heathrow to the top. The new building will have large north-facing windows, which will fill the terminal with natural light, and yet prevent the building from reaching uncomfortable temperatures. This therefore reduces the need for artificial lighting and heating, making it a very economical building. 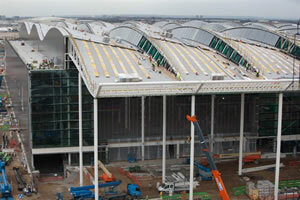 Why are we telling you about Heathrow’s new terminal? Armorgard have been supplying a range of their tool storage products, through hire shops and distributors, to protect the tools and equipment of construction workers on the terminal 2 building site. The products that have been in particular demand are the Armorgard TuffBank, SiteStation and FlamBank, due to the high security and the ultimate protection for tools and equipment, that these products offer. 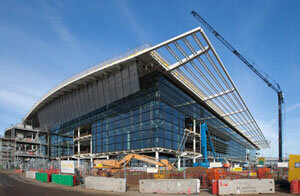 Perhaps you would like to supply Armorgard storage products to the Heathrow Terminal 2 construction site? Or perhaps you have customers working on similar sites to this? Give us a call... 023 9238 0280!